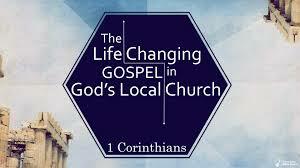 In 1 Corinthians 9:12–18 Paul turns his full attention to the gospel of Jesus Christ. In the first twelve verses of the chapter, Paul recalls the “rights” he has to receive support, rights he will gladly forsake in verses 12, 15, 18 in order to preach the gospel free of charge. As Paul continues to give a personal example of how to give up rights for the sake of serving others, he speaks of (preaching) the gospel seven times in seven verses. What do we do with the gospel? Nothing is more important that knowing and rightly responding to the gospel of Jesus Christ. Therefore, take time to listen to the sermon or read the notes. The discussion questions and related resources listed below can also help you better understand and trust, treasure, and talk about the gospel. Nevertheless, we have not made use of this right, but we endure anything rather than put an obstacle in the way of the gospel of Christ. 13 Do you not know that those who are employed in the temple service get their food from the temple, and those who serve at the altar share in the sacrificial offerings? 14 In the same way, the Lord commanded that those who proclaim the gospel should get their living by the gospel. What is the gospel? What is not the gospel? What is the difference between ‘the gospel of Jesus’ (which is never used in Scripture) and ‘the gospel of Christ’ (which recurs 8x)? What role does the Old Testament play in understanding the gospel? Read Romans 1:1–7 and 1 Corinthians 15:1–8. How do these two passages define the gospel? In what way is the gospel more than an escape route from hell? How does the story of the fisherman illustrate our need to treasure Christ and tell others about Christ? (See also Matthew 13:45–46; Matthew 25:14–30). Why is it necessary to treasure the gospel? How does ‘treasuring Christ’ inform (or reform) our understanding of trust Christ? What does it say about someone’s spiritual condition if they do not (want to) treasure Christ? If you struggle to talk about Christ, do you know why? (Do you need more understanding, more boldness, or more time to meditate on him?) More practically, if telling others about Jesus comes from a heart full of Jesus, what can you do to meditate more fully on Christ? What does it mean to turn everything towards Christ? How does Paul uses circumstances to turn conversation towards Christ? Paul will say that his own life embodies the marks of the cross; how does his personal suffering magnify the effects of the preached gospel? (See 2 Corinthians 1:3–7; 4:7–12). Read over Matthew 28:18–20; Acts 1:8; Romans 10:13–17; 1 Peter 2:9–10. Pray for passion to share Christ, opportunities to share Christ, and people with whom you have or could share Christ. Lord, open our hearts to receive more of your love. From your love, compel us to make your gospel known to others. Grant us eyes to see those who need to hear the good news of Jesus Christ, give us tongues to speak persuasively, and give us feet willing to walk across the road or the fly across the ocean to share Christ with others. Build your church, as we witness to the resurrected Christ.